(Natural News) In a “stuff hits the fan” scenario, there are so many things happening at once you’re going to have to worry about, it will seem overwhelming. For tens of millions, it will be overwhelming. That’s because they will have not prepared one iota for the collapse that many still believe is coming, despite the positivity generated by the election of Donald J. Trump. Besides the obvious – food, water and shelter – you’re going to have to consider how you will communicate: Between members of your group, between members of other groups and perhaps even the remnants of law enforcement and the military that may still remain. Cell phones are going to be worthless. Landline telephones are practically a thing of the past already, but even if they weren’t, standard telephone lines would be dead either through sabotage/damage, or because there wouldn’t be anyone around to maintain them. In particular, citizen’s band – or CB – radio technology is all you’ll need to use. It’s safe, reliable, and because it’s been around for decades, it’s very inexpensive to buy. 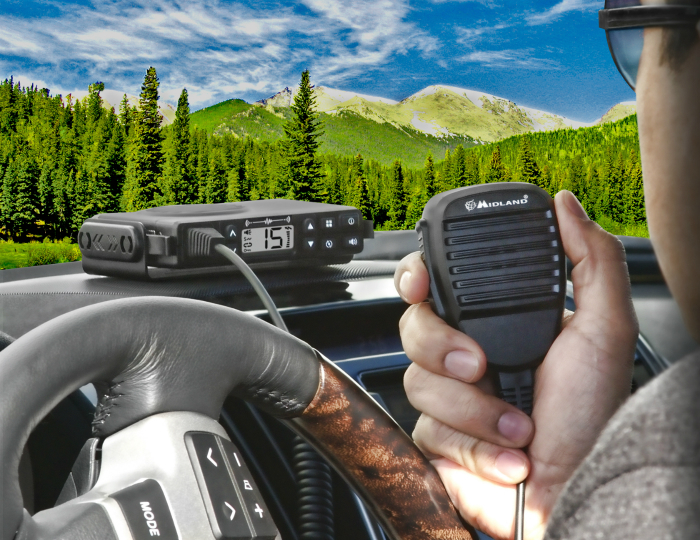 One alternative is to invest in handheld CB radios – walkie-talkies, as they’re called. The problem is these devices can be pricey, if you want a good pair, and they are not very hearty. They also require batteries to operate, and frankly, most of these don’t last long, requiring you to change out batteries very frequently. Not only is that impractical, but in a bugout scenario, would you rather fill your pack with food, water, first aid supplies and clothing, for instance, or take up space with batteries? No, the better alternative is to buy a small, mobile CB unit – that is, one originally designed to be installed in a vehicle or boat. These tend to have better range, are more robust, and can operate using a small, inexpensive and lightweight solar panel (so they are easily rechargeable). – Custom made CB dipole antenna …. around $10.00. – Padded Shoulder bag, this bag held some sort of medical device. It was purchased at a thrift store for 80 cents. – Small camera pouch with belt loop… 10 cents at a garage sale. The website noted that the primary time investment in putting this makeshift communications bag together is the battery and the antenna. The most important thing to consider here is making sure that you get a solar battery pack that is powerful enough to power your radio (so you’ll have to look at the radio’s power requirements – how many amps it draws, etc.). Now, you should know that the smaller the solar panel array, the less amount of time you’ll have to operate the radio on a single solar charge. Smaller arrays will only give you about 45-60 minutes of operating time. Some experts say an hour of talk time is probably a lot more than most people would need, but it’s always better to have as much time as possible; just make sure you follow the manufacturers’ instructions. You can see how the kit was assembled here. For more prepping and gear discoveries, visit GEAR.news.